In the Zoo Sauvage Milak’s and Aisaqvak’s baby boys are growing and doing fine. As usual I’ve made some screen shots for those who can’t see the video. Zoo Sauvage – UPDATE! The cubs have names now! Aisaqvak’s and Milak’s baby boys are growing and developing well. Now it’s time to give names to the cuties. Gestern hieß es Koffer packen für eines der größten Landraubtiere der Erde. Eisbär Wolodja (7) ist am Mittwoch in die Niederlande gezogen. Genau drei Monate ist das neun Kilogramm schwere Eisbärbaby aus der ZOOM Erlebniswelt Gelsenkirchen alt. Es ist ein Mädchen. After roughly two decades at the Alaska Zoo, Ahpun the polar bear suddenly died last weekend, according to zoo officials. / The UK’s only female polar bear Victoria, has given birth here at the Highland Wildlife Park! Unsere beiden Eisbären Nika und Kap sind heute das erste Mal auf der Anlage zusammengelassen worden. Und sie verstehen sich richtig gut. / Anana’s baby is a girl! May we proudly present our polar bear boy ARON! The name contest is now finished. Totally 3821 names were suggested. 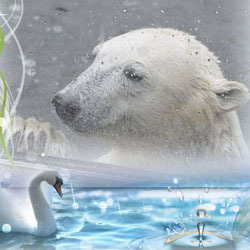 The zoo staff and the association ‘Friends of the Tallin Zoo’ chose the name Aron. Even Frida in the Tallinn Zoo has presented her cub to the media and to the visitors. Before she let her son out she took a thorough look at the enclosure to make sure it was safe for her baby to make his entré. Nanuk has taken her first swimming tour with mama Sesi and showed everybear and everybody that she’s already a very skilful swimmer! In the video you’ll meet Malik and her cubs – and you can also see a glimpse of papa Lars. Nöel in the Copenhagen Zoo was treated with lots of snow and ice on the International Polar Bear Day. What could be a better way to celebrate this special day? I’m sure Madame Nöel was happy about the white gift while waiting for Nord’s arrival. Log in | 49 queries. 0.825 seconds.